Observation - Barnacle-like apothecia - UK and Ireland. Description: Almost white crustose thallus on deciduous tree trunk. Apothecia look a bit like barnacles at first. The apothecia have rising thalline margins with proper margins visible inside. Possibly Thelotrema lepadinum. 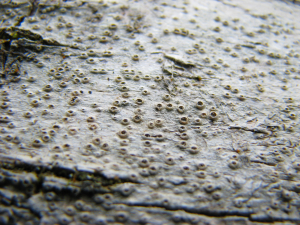 Almost white crustose thallus on deciduous tree trunk. Apothecia look a bit like barnacles at first. The apothecia have rising thalline margins with proper margins visible inside. Possibly Thelotrema lepadinum.